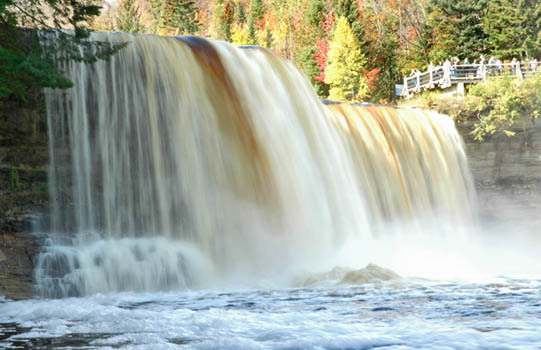 The beautiful Upper Tahquamenon Falls and the The Tahquamenon Falls State Park is a spectacular Michigan attraction. 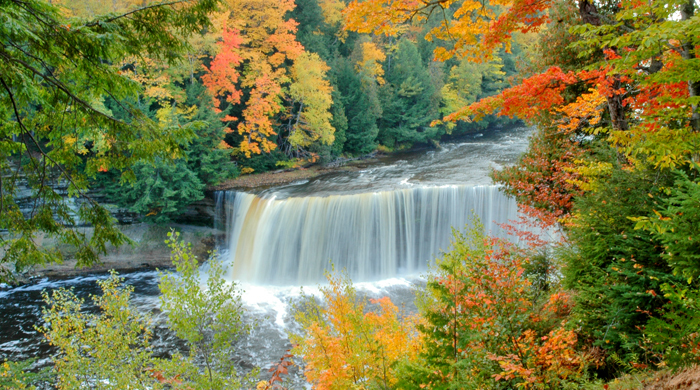 The Tahquamenon River, which feeds the falls, was made famous in the Longfellow poem Hiawatha. 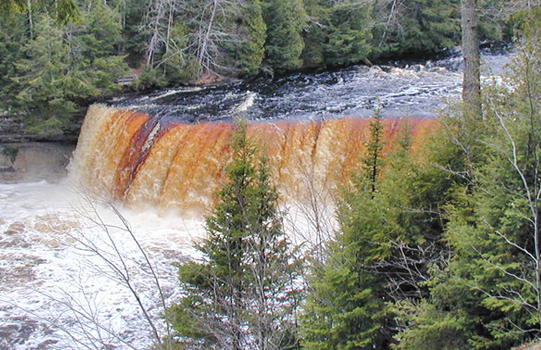 According to indian lore, the origin of the name Tahquamenon is attributed to the water's amber color, which is a result of the leaching of tannic acid from the cedar swamps. 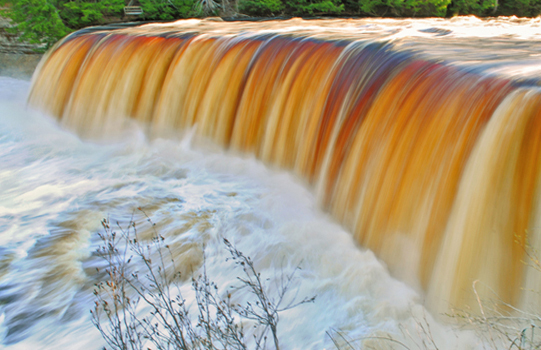 The Tahquamenon is special in many ways—especially it's size. 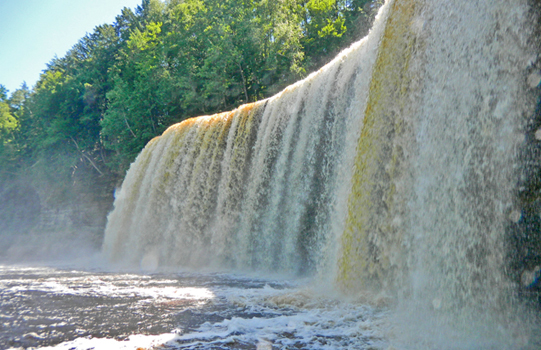 We invite you to experience one of the United States most breathtaking waterfalls—the Upper Tahquamenon Falls of Michigan's Upper Peninsula. 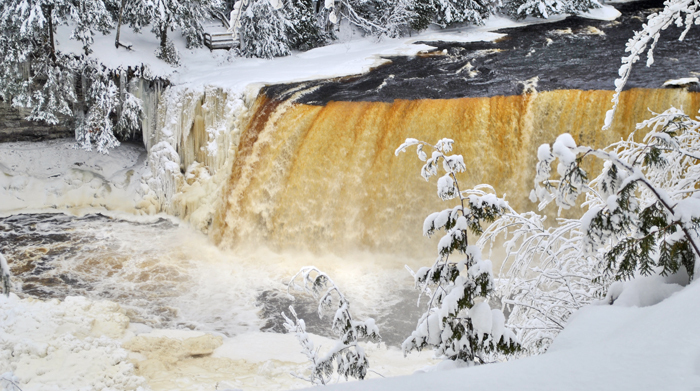 Set within a pristine wilderness, the Tahquamenon Falls is over 200' wide and 48' high. A magnificent walk path will direct your way through the forest within the Tahquamenon Falls State Park. These Upper Falls are the second largest waterfalls east of the Mississippi. Visitors will love the spectacular scenes that are available along the nature trail down to the falls. 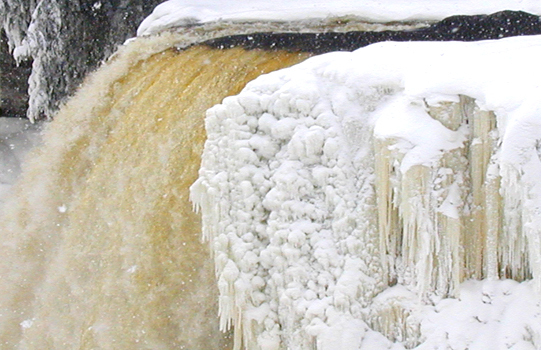 Several viewing platforms are available to admire and photograph the falls. 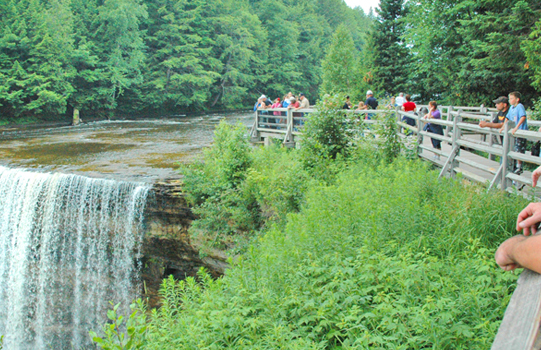 You are also invited to venture down to the main observation platform for an up close view of the Tahquamenon Falls. Please be aware that this entails a total of 94 steps. There is a sitting bench at the top for those who wish to rest, while others take the journey down the stairway. 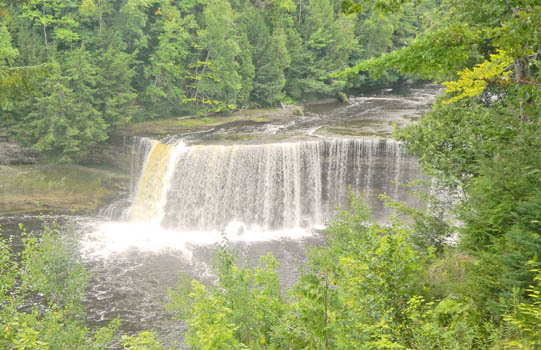 Rising from springs north of McMillan, the Tahquamenon River drains the watershed of an area of more than 790 square miles. From there, it travels the distance of 94 miles before spilling into Whitefish Bay. The amber color of the water is caused by tannins that leach from the Cedar, Spruce and Hemlock in the swamps drained by the river. 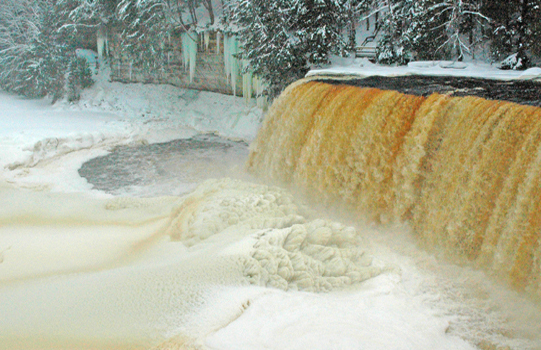 The extremely soft water churned by the action of the falls causes the large amounts of off white and amber colored foam. This has been its trademark for many generations. 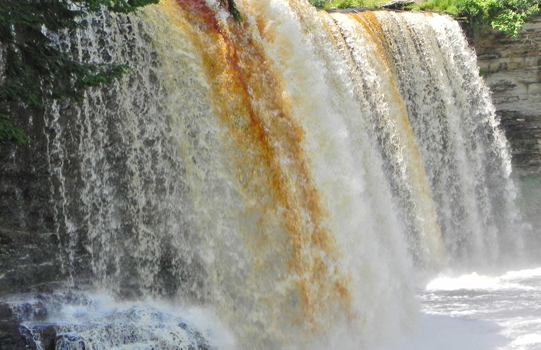 The lower falls, located four miles (6.5 km) downstream, are a series of five smaller falls cascading around an island which can be reached by rowboat. A hiking trail runs between the falls along the riverside, and visitors often play in the lower falls during the summer heat. Did you know that Newberry is the official "Moose Capital of the State of Michigan"? 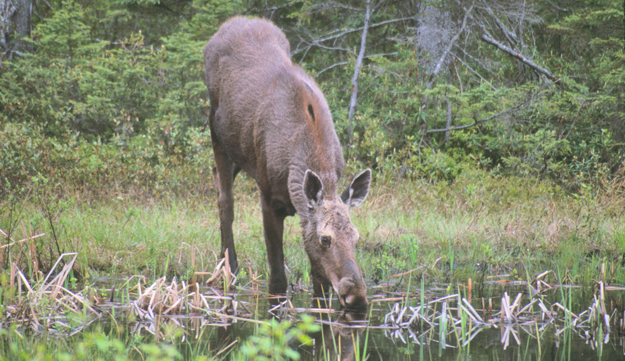 Moose are very elusive creatures, but most sightings of area moose (within Luce County and Newberry MI) occur in the Tahquamenon State Park. The area and terrain is immense and a perfect setting for the lifestyle of the moose. Feeds on woody plants in winter. Feeds on water plants in summer. They can weigh up to 1,500 pounds!